As a challenging instrument to master, the learner should be patient at the initial stages in building the correct techniques. 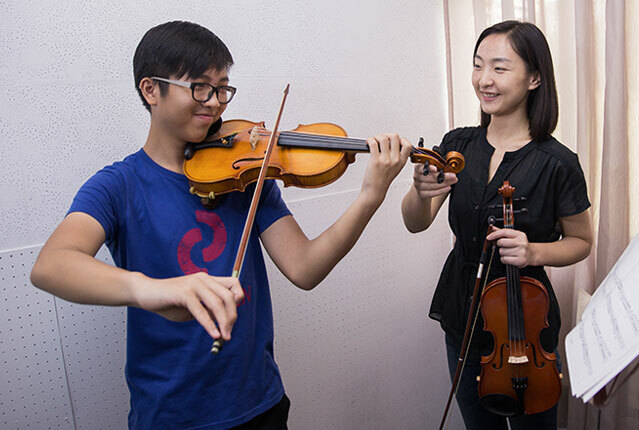 Our trainers will begin with posture, holding the violin and the bow and playing on the open strings. Theory is not included in lessons and can be included upon request. Do I need to have music background before learning violin? No, you do not need to have any music background. Our trainers will start from basic. Do I need to have a violin to start lessons? Yes, you will need to have a violin before starting lessons as we do not provide the instrument in class. Violins of different sizes are also needed for children of different ages. Our shop sells entry-level violins for just slightly above $100. At what age should I start learning the violin? We recommend learners to be about 5.5 – 6 years old before learning the violin as the child’s fine motor skills needs to be adequately developed to be able to learn bowing techniques properly.